A new international study finds that the Atlantic meridional overturning circulation, a deepocean process that plays a key role in regulating Earth’s climate, is primarily driven by cooling waters west of Europe. University of Oxford researchers Helen Johnson (Earth Sciences) and David Marshall (Physics) participated in the study, led by Duke University in the United States and the National Oceanography Centre in the UK. “The overturning circulation has a major impact on how the Atlantic sector responds to climate change” said Marshall. “Recent work at Oxford has shown that the high latitude North Atlantic is the most important region for understanding how the overturning responds to anthropogenic climate change”. 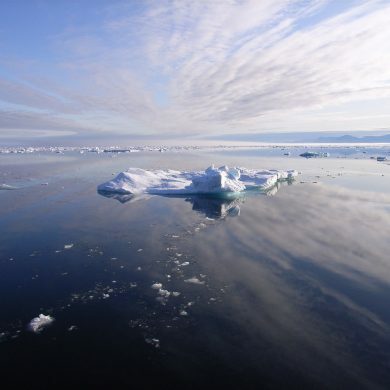 “These findings, unexpected as they may be, can help scientists better predict what changes might occur to the meridional overturning circulation and what the climate impacts of those changes will be”, said project lead Susan Lozier (Duke University, United States). “As scientists, it is exciting to learn that there are more pieces to the overturning puzzle than we first thought,” said coauthor Johannes Karstensen (GEOMAR Helmholtz Centre for Ocean Research, Germany).